What’s not to love about a good pair of tactical boots. They’re the ultimate all-purpose boot that you can use for anything from the workplace to a mountainside. Today, we’re going to be breaking down everything that you need to know about tactical boots so that you can choose the best boot for you the next time that you’re out shopping. 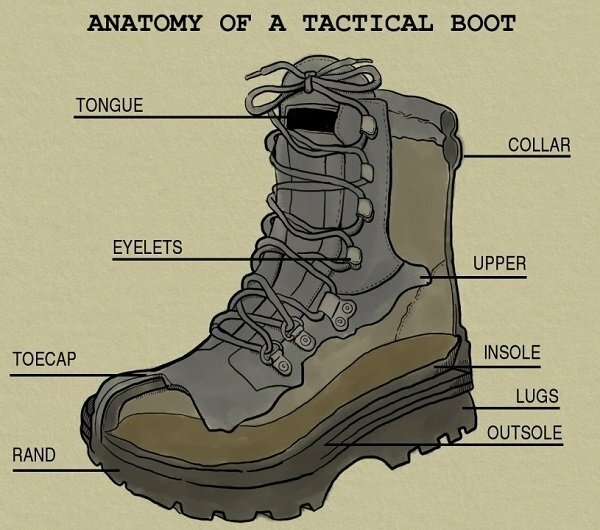 First, we'll cutaway the anatomy of the boot, then go over the different types of tactical boots and their various benefits. Then, we'll go over how to keep them clean and ready to go. How Are Tactical Boots Different From Other Boots? Looking at their name, you can probably guess that tactical boots have their origins in military use. They were created specifically for soldiers who had to operate in harsh and demanding climates. These boots aren’t made for fashion purposes, but are made solely for the purpose of giving your feet the best protection and adaptability that you can get for the money. One of the biggest features that you’ll notice is the material. A lot of the time, tactical boots are made out of synthetic material that is more durable than leather or that has other features like advanced wicking or waterproofing. Another big difference is the laces. 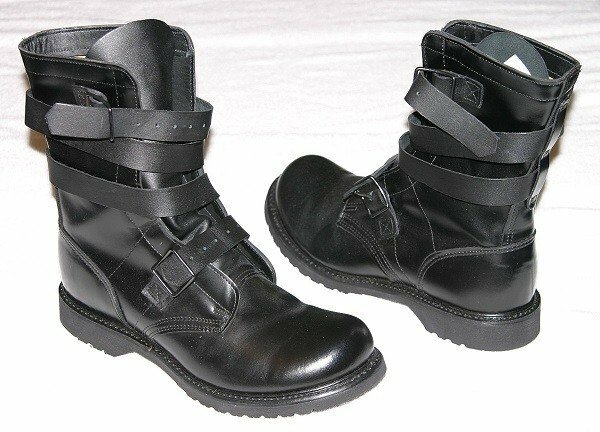 Tactical boots will usually have a lot more to lace up and tighten than your traditional work boots. One of the final benefits to mention about tactical boots is the sheer amount of options that you have available to you. There is a pair of tactical boots to fit every type of climate, color scheme, or comfort level you could ever imagine. Tactical boots are a lot different from other boots. They were designed for all-purpose uses and can handle quick motion, slippery terrain, and are often weatherproofed. Traditional boots, while usually durable, aren’t made for vigorous activity. They’re made to protect your feet while walking around a job site or tramping through the dirt. Let’s take a few minutes to break down some of the exact differences. Weather proofing is one of the biggest reasons that people choose tactical boots over traditional work or hiking boots. Tactical boots were designed to keep soldiers' feet dry and protected and to prevent them from getting swamp foot or frostbite depending on the environment. Depending on the style of boot that you get, this weatherproofing will vary. If you're getting a pair for the desert, they'll probably have a breathable mesh upper and a waterproof lower. If you're getting a pair for the forest, the boots will likely have light insulation and be completely waterproof. Tactical boots for the snow, on the other hand, will have lots of insulation and complete waterproofing as well. Since tactical boots are designed for more active situations, they are usually a lot more comfortable than traditional boots. Take your traditional work boots for instance. They look nice when you walk into work with them brand new, but they’re guaranteed to give you a few blisters while you break-in the stiff leather uppers. Tactical boots are designed to be ready-to-go, though. You can run a 5K with a good pair of tactical boots. Just ask the soldiers in bootcamp who train all day and night in them. Sure, they aren't quite as lightweight and free as a pair of cross trainers, but they are nowhere near as stiff and heavy as a pair of traditional boots. Tactical boots are definitely known for their sturdiness (as long as you manage to get a good pair that is). They’re designed to be dragged through forests, jungles, blizzards, and mountains multiple times a year without giving out. These boots usually have lots of extra protection and padding around areas that commonly rip and tear in traditional boots. This allows you to put them through a lot harsher treatment. If you're making a boot that's designed to keep hikers and military personnel safe, you had better make it safe. Tactical boots are some of the safest boots that you can find. 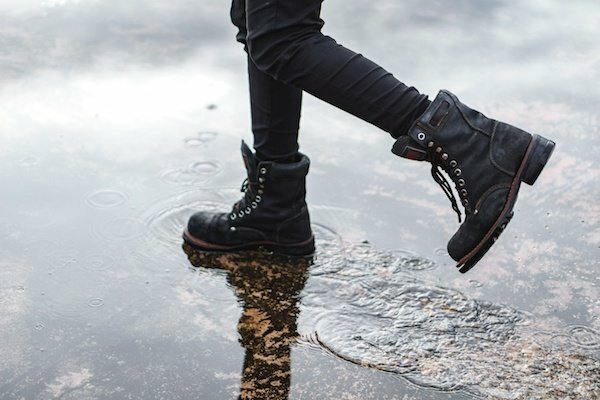 Besides the waterproofing and weatherproofing features designed to keep your feet warm and dry, you'll also find plenty of other great additions that can save your life in the right situation. 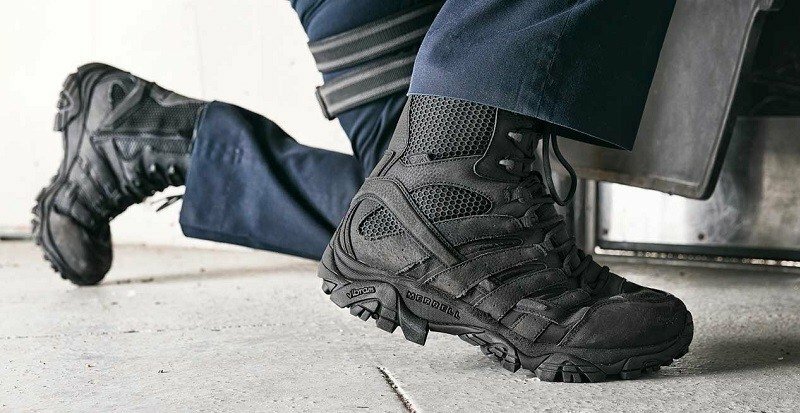 Most tactical boots will include some type of protection against electrocution which is essential to have if you’re working around high-voltage lines or in wet environments where there may be live electrical wires. Additionally, many tactical boots are made to be slip resistant on oily surfaces, or are built to be able to grip onto sharp rock surfaces. Finally, some tactical boots will include a steel or hard plastic toe. This means that your feet will be protected if heavy or sharp objects fall on top of them. It’s worth noting that if you get a boot with a steel toe, it will be a little bit heavier and less flexible than a soft toe boot. If you're spending over $100 on a pair of boots, then you're going to want a pair that can last you for at least a year or two before they need to be replaced. Tactical boots are known for being very reliable, as long as you get a good pair and not some fake Chinese knock-offs. How long your boots last, though, will depend a lot on how often you use them. If you only take them out a few times a year, they can easily last for five years or more. If you’re using them every day in rough environments and harsh terrain, then they may only last 8-12 months. On average, however, a solid pair of tactical boots should last you 1-2 years if you take care of them. Now, that we’ve sold you on all of the benefits of a solid pair of tactical boots, let’s take a few minutes to break down the anatomy of your typical boot. One of the most important factors in buying a good pair of boots is that they fit your feet properly and are comfortable. Some may require more or less arch support, prefer a different firmness of the sole, or want shorter or higher uppers. Take a minute to think about what type of feet you have, and the environment that you’re going to using your tactical boots in. These two things should be the determining factors when you’re picking out a pair of boots. The outside of the boot is known as the "upper boot," and is essentially everything that you see except for the sole. The upper boot contains most of the safety, durability, and weatherproofing features, and is probably going to be the deciding factor of what type of boot you end up buying. The first thing that you’ll want to look out for is the height of the boot. Most tactical boots are classified as a mid-top or a high-top. Mid-top boots will stop halfway between your ankle and your calf, whereas high-top boots will go all the way up to your calves. If you’re going to be outside in a warm environment or doing some climbing activities that require you to have lighter feet, then you’ll probably want to opt for a mid-top boot. However, if you’re going somewhere that’s cold and wet, you’ll want the high-top so you can walk through puddles or snow drifts with complete confidence. Depending on their purpose, your pair of tactical boots will usually be made with a mix of materials. It's rare to find a pair of tactical boots that are all-leather, for instance. Most will be a mix of leather, synthetic materials such as teflon or nylon, and a breathable mesh. Consider what your personal needs are (hot or cold climate, wet or dry ground) and choose the combination that best fits what you’ll be doing. Your midsoles are the part of the boot that your foot rests on. This means that they determine the overall comfort of the boot and how your foot feels in them. Some will be firm and others soft depending on the boot. In general, if you’re going to be doing a lot of high-impact exercise, then a softer sole will protect the joints in your knees and ankle better than a hard sole. The one advantage of having a firm midsole is that you’ll be able to feel the ground better than you would otherwise. This can be useful if you plan on doing a lot of vertical climbing or you’re walking across a slippery river bed. If you’re somebody who needs arch support, then you’ll definitely want to take a close look at the midsole. Some soles will have a hard and prominent arch, whereas others will be less defined and have a little more bounce to them. Additional support may be offered in the heel of the boot as well. Some boots will feature built-in gel pockets or spring mechanisms that held to absorb shock and will go a long way to preventing your feet from getting tired and painful after a long hike. Last, but not least, you need to pick a pair of tactical boots that has a great outsole. This is the bottom sole of the boot that will be making contact with the ground the entire time, so you need to make sure that it has a good tread and can handle a lot of abuse. All outsoles will be waterproof, but you will want to look at whether or not they're slip-proof or resistant to electricity. These two features are especially important if you're going to be wearing your tactical boots in a work environment where these hazards are an everyday occurrence. You’ll also want to look at the tread depth of the boots. If you’re going to be hiking through a bunch of mud, you want a deep tread that can handle all of the dirt and push it out the sides. Conversely, if you’re hiking through the desert sand, you’ll want a wider sole with narrow treads to prevent your foot from sinking. Throughout the article, we’ve discussed various different types of tactical boots and referenced certain environments that they may or may not be suited to. To clear up any confusion in the air, let’s take a few minutes to differentiate the different types of tactical boots that you’ll come across while shopping. Standard issue tactical boots are by far the most common. They are the basic boots that are issued to police and infantry soldiers around the world. They are usually waterproof, slip-resistant, have soft soles, and have hardened leather or synthetic uppers that resist all-terrain wear and tear. These type of tactical boots are all-purpose and can handle the wide variety of different terrain from snow to swamps. They usually have a mid-range level of insulation that can keep feet warm in cold temperatures, but that won’t be too hot in a warmer climate. 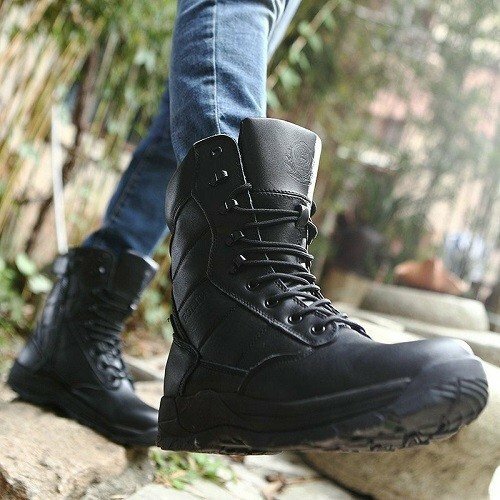 If you're just looking for a great all-purpose boot that can handle almost anything that you throw at it, then purchasing a standard issue military boot is the best way to cover all of your bases. The military is usually very specific about the brands that they authorize as "standard issue" for their troops, but while browsing through pairs of boots, you're bound to see a lot of boots with the label. Who doesn’t love the classic look of a pair of tall jump boots? They were first invented for US Army paratrooper squadrons in World War II. Tales of paratroopers’ bravery in the face of unbeatable odds helped to drive the popularity of this style of boot back home, and it quickly became an iconic boot that was both functional and fashionable. Essentially, these boots are designed to keep your feet, ankles, and knees safe during parachute landings (which are a lot rougher than they look like on tv). They almost always feature reinforced ankle and heel sections which are designed to stabilize the joint and prevent it from rolling on impact. The heel will likely have advanced gel padding or a built-in spring system as well. Another feature added in more recent years is a hard toe to prevent you from getting injured in the event that you kick some rocks on your way down. The entire boot will be made of a stiff, hardened leather material that resists lateral motion, is hard to bend, and helps to keep the entire ankle and calf sturdy. This being said, jump boots aren’t the best boots to get if you’re looking for something to be mobile in. The high-top upper, wide soles, and stiff design aren’t very conducive to long hikes, runs, and climbs. However, if you’re going to be doing a lot of base jumping or plan on falling out of airplanes, then you should definitely own a pair. While most people don’t usually find themselves on the inside of a tank on a daily basis, these are still some pretty awesome boots that have lots of other applications. The original design was put forth when General George S. Patton was creating the uniform guidelines for the Tank Corps. The first thing that you’ll notice is that these boots don’t have any laces. Originally, this was a safety feature designed to prevent laces from interfering with any of the moving parts within the tank. 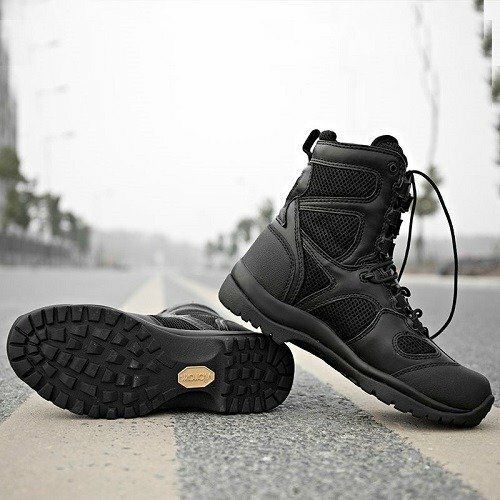 This makes them a great choice for a pair of tactical boots if you’re going to be operating around a lot of heavy machinery or hiking through thick vegetation which might catch a loose string. Looking past the surface, tanker boots are also known for being incredibly heat resistant. This makes them a good option if you’re going to be working in around fires or hot metal surfaces that you may face as a welder or sheet metal worker. The soles on tanker boots will always be slip-resistant as well which makes them another great choice for the industrial workplace environment. You’ll be able to walk over oil spills and run up the metal staircase without worrying about falling and breaking your neck. If you’ve ever had to walk through a bunch of hot sand dunes with a traditional pair of hiking shoes, then you know just how bad it can get. Desert boots were designed to be sand-resistant in every form of the word. They lace up tight around the calves and have built-in “vents” that help trapped sand escape and fall off of the boot. Desert boots have very little insulation or other metallic material which would draw heat and make them hot. They’re often made with a suede leather that can stand up to the rough sand and won’t easily scratch. Winter tactical boots are designed to keep you warm and dry in even the most extreme arctic climates. They have lots of insulation which is able to keep your feet at room temperature in sub-zero temperatures to prevent the onset of frostbite or numbing of the extremities. Another really nice feature of these boots is that they’re 100% waterproof to prevent the snow from seeping in, melting, and re-freezing around your feet. The outer soles are usually fairly wide as well which helps to spread your weight across the surface of the snow and prevent sinking. When most people think of jungle tactical boots, they’ll probably think of the ultimate waterproof boot at first. However, jungle boots are actually just the opposite. They usually have quick-drying canvas material which won’t hold moisture for long. The soles also have special eyelets to allow water to drip out. The idea is for the wearer to be able to hang them up to dry after a long wade through muddy swamps. Within an hour, they should be dry and ready to use again. If you do a lot of hiking outdoors in mountain or jungle terrain, these are a great type of tactical boots to consider. Despite their name, tactical boots are available to anybody who may want to wear them. Military - If you’re in the military, you’ll be required to buy a specific brand and type of boot to go with your uniform, so your options will probably be limited. However, if you’re retired and just miss the feel of your training boots, you have plenty of options available to you. Police - Active duty police officers or S.W.A.T teams will often have special black tactical boots designed for close-quarter combat, and quick maneuvers while chasing down a target. Hikers/Backpackers - If you do any hiking or backpacking, you know the value of a great pair of all-purpose boots that will last for years. Because of this, tactical boots have become very popular in the outdoor community. 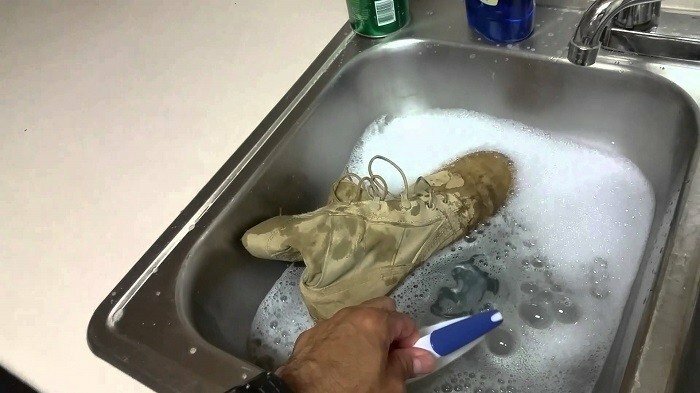 The great thing about tactical boots is that they’re usually pretty easy to clean and dry. Here’s the basic process. Since most tactical boots are at least semi-waterproof, the easiest way to clean them is to give the outers a quick scrub with a soft brush and some soapy water. If you have 100% waterproof boots, then you can just spray them down with a hose. To dry your tactical boots, the best thing is to remove the laces, take out the insoles, pull the tongue down and put them by a heater or out in the sunlight. If you’re in a pinch for time, you can also throw them in a dryer. There you have it! The complete guide to tactical boots. Hopefully, you now have a better idea of what you want, and the features that you should really be looking out for. A great pair of tactical boots will last you a long time and can be used in almost any situation that you could imagine. If you're still undecided on what to get, we've created a great Buyer's Guide to help you pick out the best pair of tactical boots for your purposes. We weeded through all of the cheap knock-offs and came up with a list of five of the best pairs of boots on the market, along with their various pros and cons.